Crawley Green secured another precious three points in their battle for runners-up with what turned out to be a comfortable 4-0 win against Langford on Wednesday night. 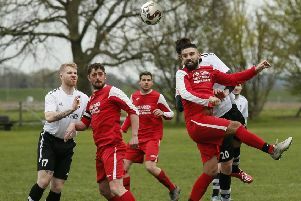 With Edgware Town crowned champions the previous evening Crawley are now left in a battle with Baldock Town for the second promotion spot. Kicking up the slope the Maroons had an early chance when Ashton Grant headed just over from an Aarron Browne cross. Langford responded with a Stephen Brooks effort which went wide following good work by the lively David Tembua. After 10 minutes Crawley should have taken the lead as Langford’s keeper Stephen Waters miss-kicked a clearance to Browne but his cross was headed wide of an open goal by Henry Mungwira. Crawley quickly followed with efforts from Mungwira and Liam McGovern which failed to test Waters and Langford replied with a shot from Tembua that was saved by Dean Bull. Minutes later Waters parried a shot from Grant and Mungwira’s effort from the rebound was scrambled clear. After 21 minutes Langford appealed strongly for a penalty when Sean McMonagle was denied by Bull, but a minute later Crawley took the lead. Mark Smith and Stuart Strange combined well down the right to release Sam Halfpenny and his shot was deflected past Waters to make it 1-0. Shortly after, Mungwira broke though the Langford defence but his effort struck the left hand post and bounced clear. On the half hour Langford were reduced to 10 men after a deliberate hand ball in the box by Ben Stocker. Strange stepped up to send Waters the wrong way and put Crawley 2-0 in front. On the stroke of half time, Langford cleared a corner and Tembua raced the length of the field but fired his shot over. Kicking down the slope against 10 men for the second period, Crawley dominated the play but struggled to turn their chances into goals. Mungwira’s luck in front of goal failed to improved when he had another shot saved by Waters. However, with 55 minutes gone, Crawley killed the game when Strange converted a Pemberton cross from the left to make it 3-0. Shortly after the unfortunate Mungwira headed over from a Strange cross and Grant then fired straight at Waters following good work by Halfpenny. To their credit Langford battled hard to stay in the game and Sean Murray was a handful for the Crawley defence all evening. Crawley had further chances missed by JJ Billy and Grant before Smith headed over from a Browne corner. In the 87th minute Crawley’s pressure finally told when Grant shot past Waters to make it 4-0 and secure the points for Crawley. Nearest rivals Baldcock were also victorious on Wednesday night though, winning 2-0 at Codicote, meaning that with four games left, Crawley are now only three points ahead. Green finishes their season with four games in eight days as on Saturday they travel to Wodson Park and then entertain Broadfields United and Edgware Town on the Tuesday and Thursday respectively, before finishing the campaign at local rivals Ampthill Town.